This was supposed to be the second half of my post about ante-natal yoga, but who can think about cobbler’s pose and mountain breathing when there is pie in the fridge? I have been threatening to make a pork pie for about three years now, it’s one of those long-term projects that exist in a completely abstract form, moving from one annual To Do list to the next year’s until I either ignore it completely or am forced into action. It had dawned on me that if I wanted to spend most of a weekend making a single pie, it was better to do it now while I can still attempt to make things that are more complex than toast and Cup A Soup. I had also made the mistake of telling Ginge, who very kindly placed an order of pig parts at our local butcher so there was no turning back. 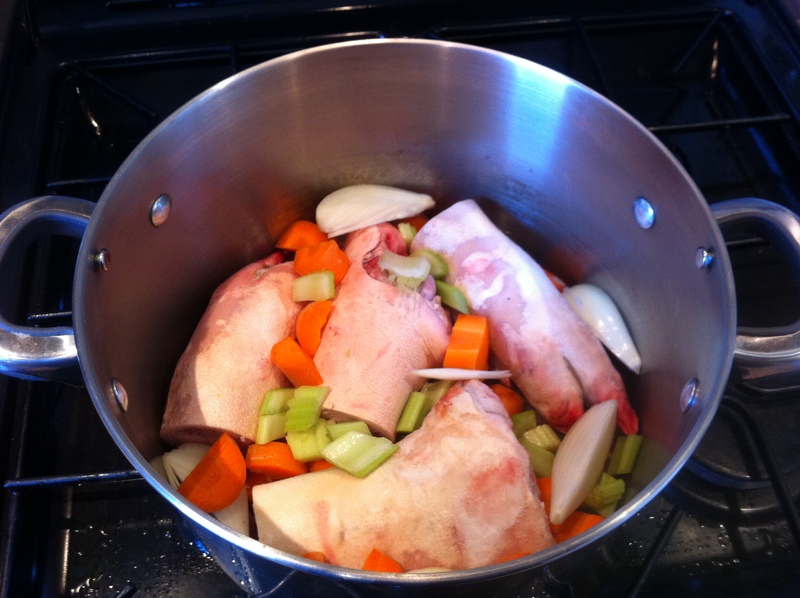 While the bacon, belly and neck were chopped and minced. 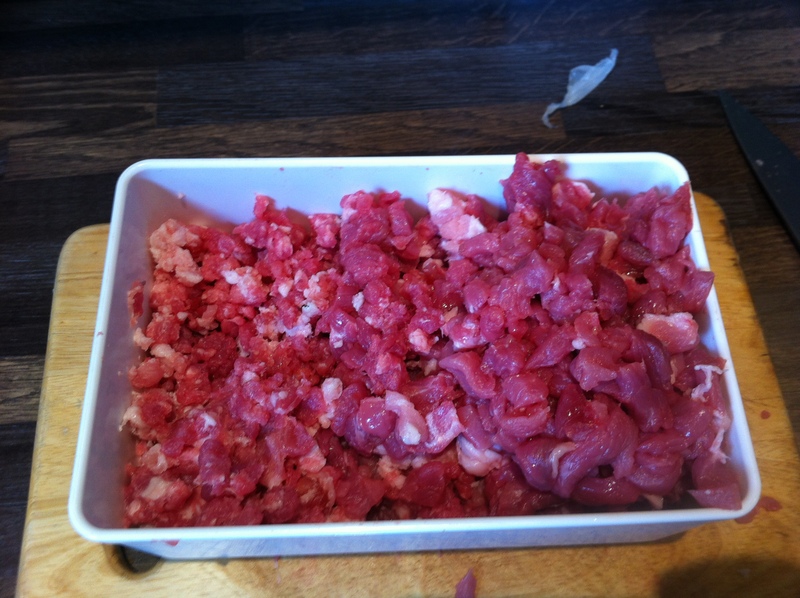 Nigel advocates hand chopping 1.5kg of meat into 5mm pieces (but concedes that giving half a quick whizz in the food processor is ok) – I opted for hand chopping half and feeding the rest through the coarsest setting of our hand mincer (for mincing by hand, not mincing hands. As a rule). 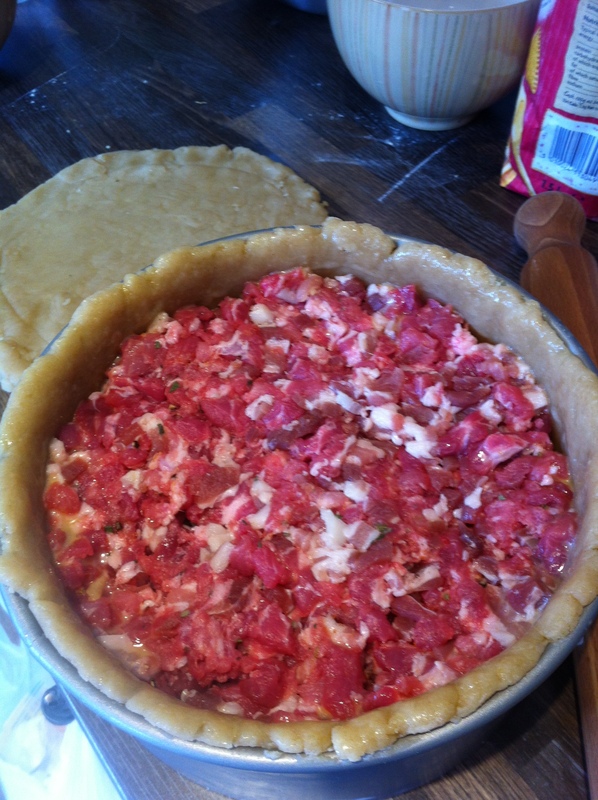 The stock bubbled away for an hour or so while I fettled with meat and cracked on with the pastry. This is the first time that I’ve made a hot water crust and was slightly fearful of the whole process. It was made easier by the fact that I was lining a cake tin with it, rather than trying to hand raise a proper crust around a mould. It was also made easier my the fact that it was a strangely enjoyable experience, a bit like messing with warm playdoh. In recent weeks I have embraced lard as an ingredient. This is probably not a good thing. And then on with the lid before going into the oven for longer than I realised (which had the bonus of giving me enough time to clear up AND have a bit of a nap). It emerged shiny and golden, but I still had to wait for the lovely stock to be properly cooled before I could funnel it in. 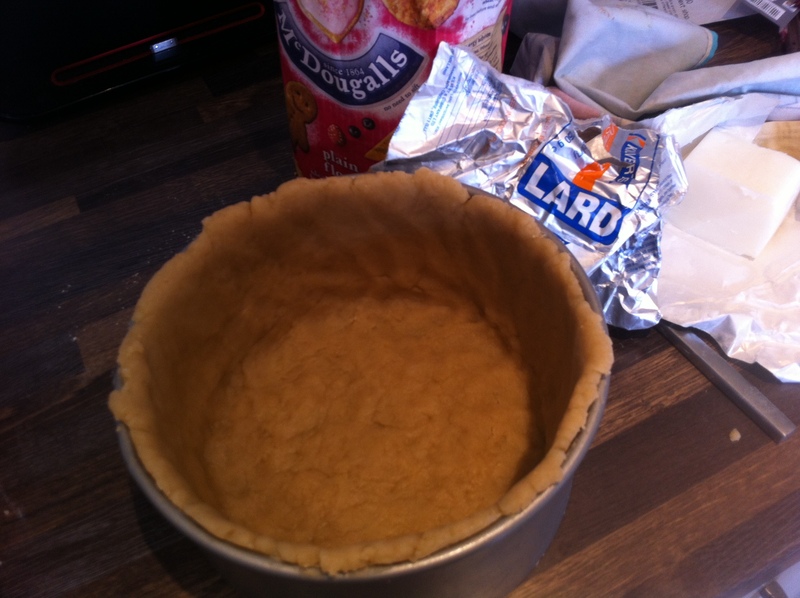 I was a bit concerned about leakage and knowing that the pie was full, but again I needn’t have worried – you know it’s full because you can’t fit any more in…. The pie stayed in the safety of its cake tin for some overnight chilling and until Ginge got home from work (delivering it from the tin was a two-person job), before we could release the first slice. I am unfeasibly proud of this venture, but am now faced with the issue of what to do with a pie that’s as big as my head. I’m SO impressed. 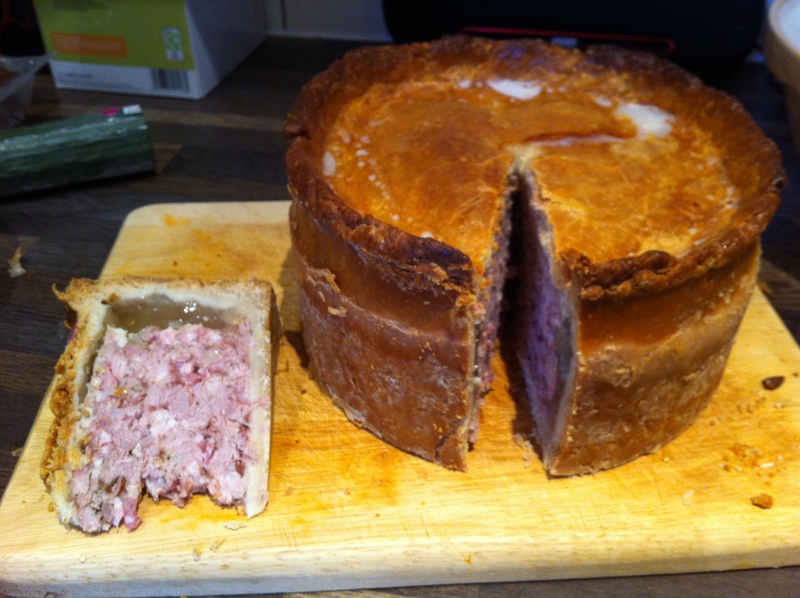 i’ve been wanting to attempt a Pork Pie for ages, but haven’t plucked up the courage. Yours looks delicious! You’ve inspired me to have a go! I thoroughly enjoyed reading the story of the pie – my that is some pie! Very impressive indeed. Can you freeze it in slices perhaps? It is rather a lot to eat on one go! I suppose if you do it again, you could make a batch of filling and freeze it in batches to pie-ify later? Hope you enjoy it all! OH wow that looks amazing!!! Well done you!